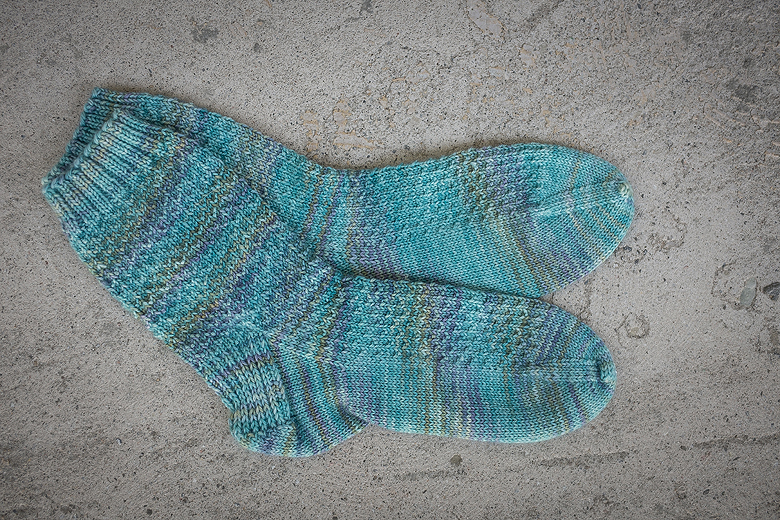 I think everybody has a “go-to” sock pattern…one they can knit with their eyes closed, or at least without ever having to pick up the pattern. 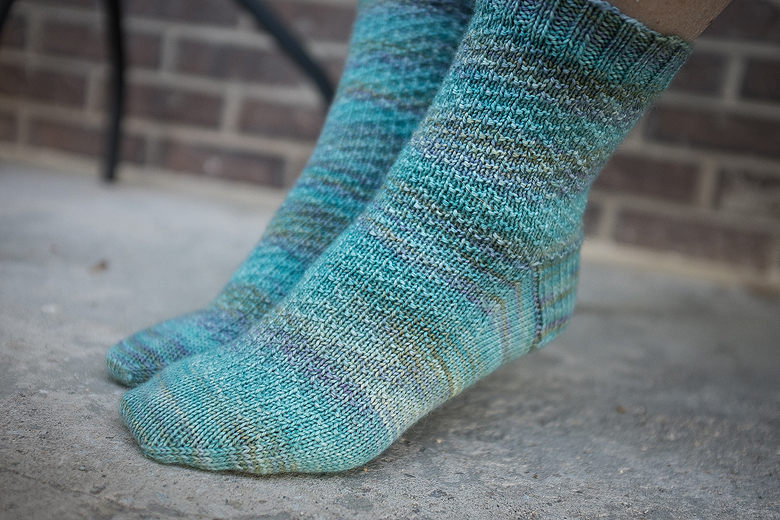 (If you read Knitting to Stay Sane, for example, you know that Glenna C.’s is Jaywalkers!) Hermione’s is mine. The texture keeps it from being as boring as plain sockinette (although as anyone who knows me can attest, I have no objections to knitting plain stockinette in the round!) while being simple enough to be my “knit in coffee shops and in front of the TV” knitting. I almost feel funny blogging about them, as they are my fifth pair of socks (in 18 months) made with this pattern, but it is the first time I have ever used Fleece Artist Trail Socks. I picked up a skein of November Sky from a Ravelry destash. To this day, I am not sure why – completely not my colour set but I thought it might be nice to break out of my rut. Now, when I really began knitting less than four years ago, I was one of those that could not understand why anyone would pay so much money for sock yarn. And worse, I liked the stuff with the cashmere…even though it was another $5-$8 a skein. But “oh noes!! Expensive yarn and all that time…to put on your feet?? Are you insane?” Turns out, I was! I blame my friend Liz, and my great teacher, Kate Atherley for making me a sock knitter. After spending some time actually knitting socks, though, I realized that yes, while the socks with cashmere were yummier and more squooshy, the 80/20 (or 75/25) blends of merino nylon do wear an awful lot better. So I set out to find some good, sturdy-yet-comfy sock yarns. I have tried several but my two favourites so far have been indigodragonfly’s Merino Nylon Sock, and Tanis Fiber Arts’ Blue Label. These two bases are completely different from one another and I like them both for totally separate reasons. Trail Socks feels very much like Blue Label, both while knitting and after the fact. In fact, so similar are they, in the tactile sense, that I’d think they were the same base. However, the yardage stated on the label of each skein suggests otherwise. In any case, it was quite pleasant to knit with and the resultant fabric is nice and comfy. And I am really in love with the colours. I am looking forward to having these when the leaves start turning. Were There Changes Made To The Pattern? I don’t even remember what the pattern looks like anymore! Anything Else? Not that I recall. Would I Make Another? : I am sure I’ll have another pair finished by Christmas. This entry was posted in Uncategorized and tagged fleece artist, fo, hermione's, knitting, socks, trail socks by Rayna. Bookmark the permalink.